This post is sponsored by The Little Potato Company. Thanks for supporting the brands that make DK possible. As always, all thoughts and opinions are my own. I am SO excited to share this recipe with you today. And, I’m currently in Florida while posting this one so it seems even more appropriate. Greek salad with potato salad!? Oh my goodness, I can’t even explain to you how deliciously weird this one is. 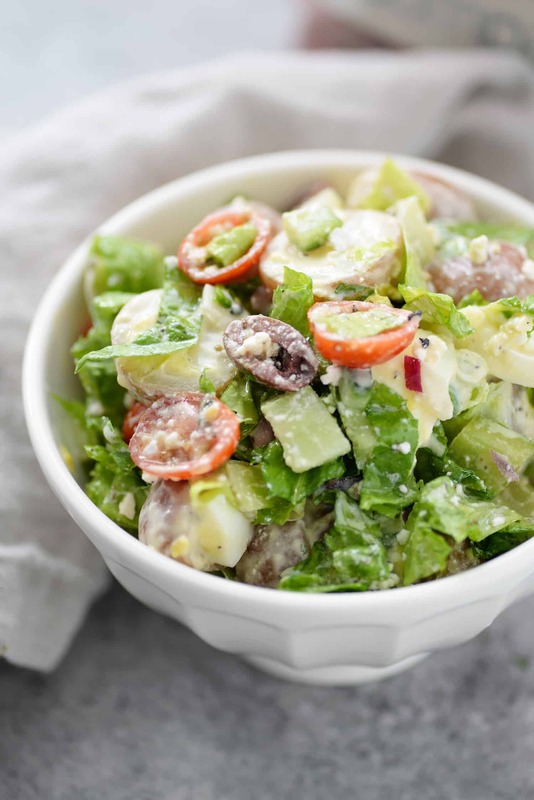 It’s creamy potato salad on the bottom topped with greek salad in a tangy, briny dressing. It hits all the spots and is my number 1 requested meal from my mom when I go home. This is the greek salad that I grew up eating, a recipe that my family inherited after my Uncle moved to Clearwater, Florida and tried this version, made famous from Pappas in Tarpon Springs. 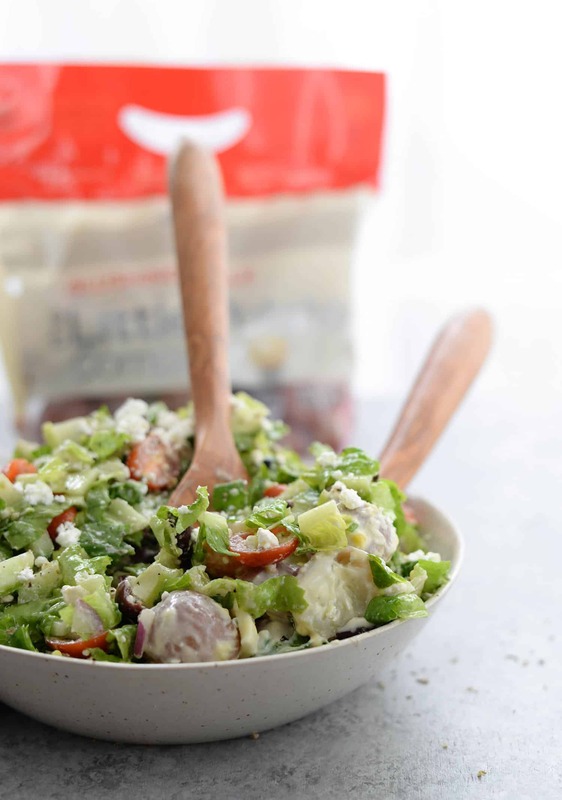 Who would have thought that the combination of greek salad and potato salad would taste so delicious together? To make this recipe come together at lightning speed, I rely on creamer potatoes from The Little Potato Company. I know that homemade potato salad can seem like an arduous task, but using little potatoes cuts down immensely on time. To start, no washing and scrubbing required– the potatoes are all ready to go. The skin is thin enough that you don’t have to peel either. Then, simply half (or leave whole, if desired- they are small enough! ), boil and toss with a tangy greek yogurt dressing. That’s it! Potato salad made in a flash. To keep this one a little lighter, I’m using greek yogurt as a base instead of mayo. 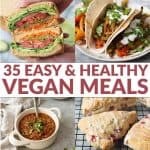 I promise it tastes just as creamy and flavorful as mayo, without as much fat and a little more protein. Then, you’re ready to make the greek salad. 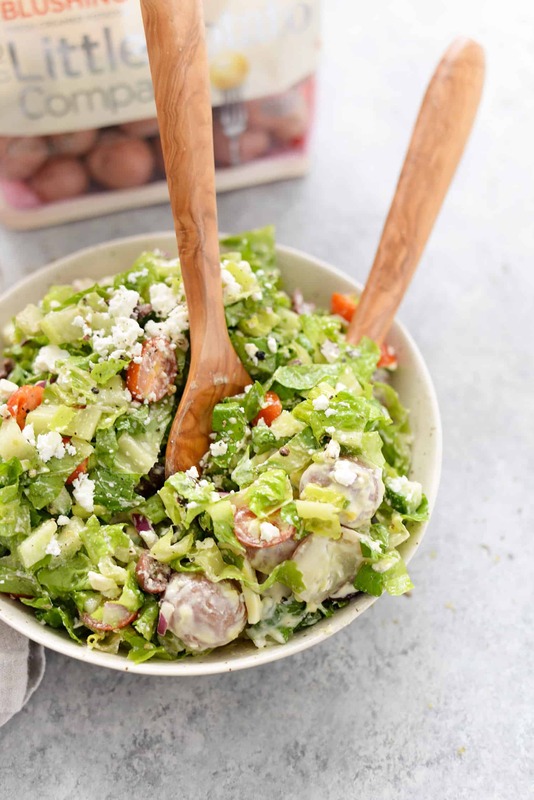 All the classics go in this one: romaine, tomatoes, red onion, olives, feta cheese and pepperoncini peppers. Don’t skimp on those! They add so much tang and mild heat to the overall meal, especially paired with the creamy potato salad. In fact, I think I might start putting pepperoncini on my potato salad in general because I just love the taste of the two of them together. To serve, spread the potato salad in whatever serving bowl/plate you are using. Then, mix together the salad with the dressing and pile on top. Use a large spoon to scoop the potato salad out with the salad and place on each plate. This is how my mom makes/serves it and it ensures that every bite gets a little salad and a little potato. Thanks again to The Little Potato Company for sponsoring this post. Tarpon Springs Greek Salad with Potato Salad. You’ve never had greek salad like this before! A layer of potato salad topped with tangy greek salad and homemade dressing. A healthy and delicious lunch or dinner option. Make the potato salad. Place the potatoes in a large stockpan and cover with water by 1 inch. Bring to a boil, then reduce heat and cook until potatoes are just tender. Remove and rinse with cold water to stop the cooking. 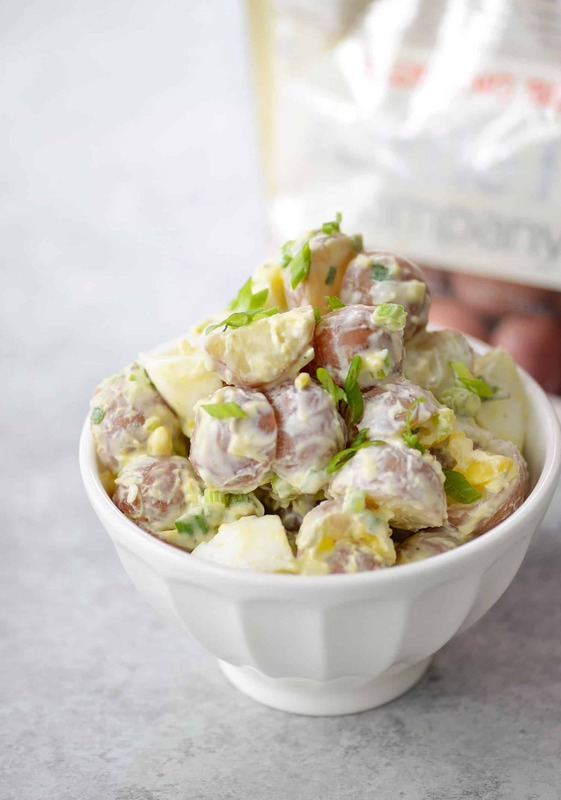 Halve the cooled potatoes and place in a large bowl along with scallions and chopped hard-boiled eggs. Whisk together the greek yogurt, mustard, vinegar, salt/pepper and mayo. Season to taste, then toss with the potatoes. Spread potato salad in a large salad serving dish and set aside. 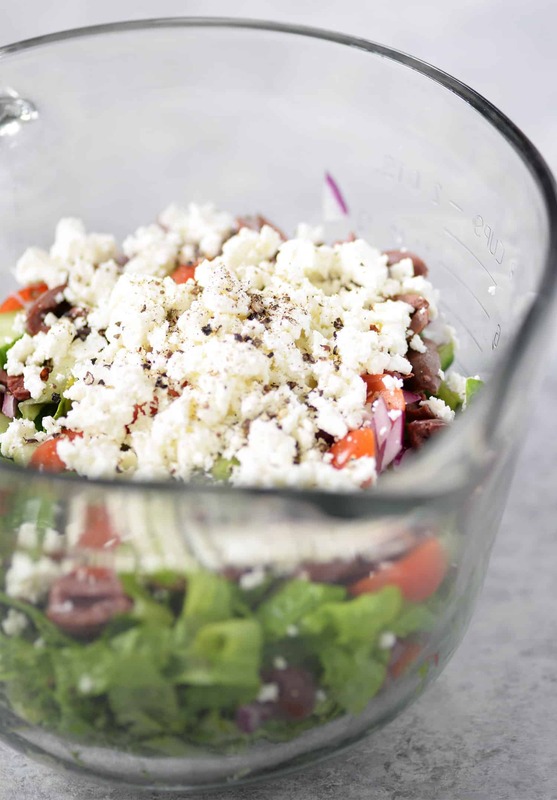 Whisk together the ingredients for the greek dressing. Season to taste, adding more salt/pepper if needed and set aside. Toss together the romaine lettuce, cucumber, tomatoes, olives and peppers. Toss with 3 tablespoons of the dressing and toss well. Stir in the feta cheese, then top the salad over the potato salad. Drizzle with remaining salad dressing (you may not need all of it) and serve immediately. Dish this out by scooping into the salad, grabbing the potato salad at the bottom and the salad on top. OMG Alex you’ve made my day! I’ve been thinking about this potato salad and googled and there you were talking about Pappas & Tarpon Springs. What delicious memories I have of that place and that salad. We were going there when it was just a hole in the wall before they built the new restaurant. I ate that salad throughout both my pregnancies (my boys are now 24 & 20). 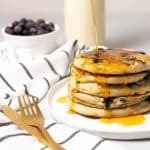 Thanks for your post and the recipe. I’m going to give it a shot! So happy to hear this! Let me know if you try it.